Zydex, a speciality chemical company with operations over 30 countries, plans to launch a very ambitious market expansion of their patented 100% Silane Nanotechnology for waterproofing. We invite accomplished leaders from waterproofing, construction chemicals, paints or building materials to lead the expansion into retail and institutional markets. Leader with proven abilities to strategize, build and lead India team for sales & specifications. Individuals with B.E. Civil (preferably) & MBA with 15-20 years of experience. Individuals with ability and flair to launch and penetrate into realty companies / contractors / applicators. Lead team for sales & specifications into BOQ's. Preferably B.E. Civil & MBA with 10-12 years of experience. 3. 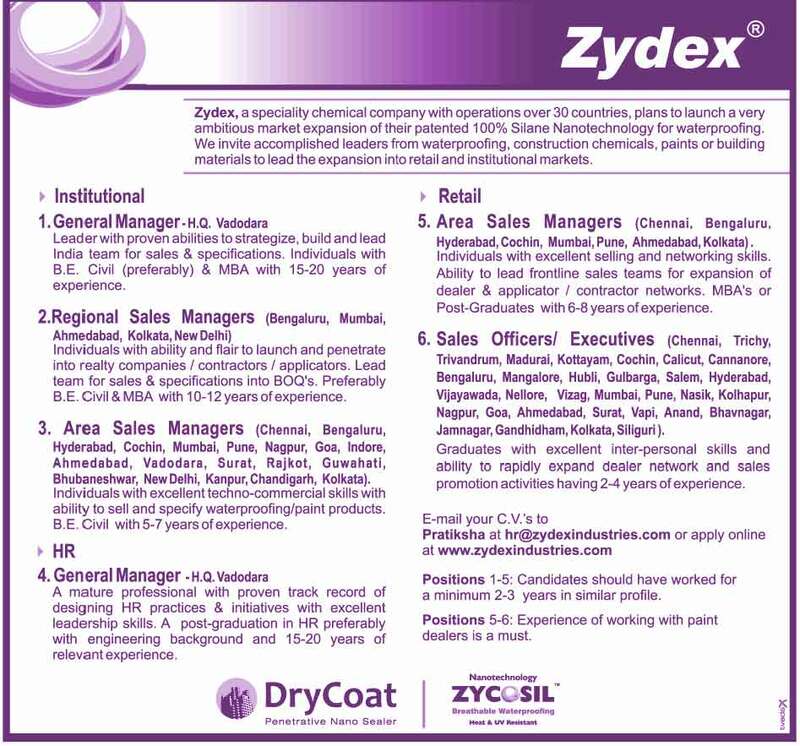 Area Sales Managers (Chennai, Bengaiuru, Hyderabad, Cochin, Mumbai, Pune, Nagpur, Goa, Indore, Ahmedabad, Vadodara, Surat, Rajkot, Guwahati, Bhubaneshwar, New Delhi, Kanpur, Chandigarh, Kolkata). Individuals with excellent techno-commercial skills with ability to sell and specify waterproofing/paint products. B.E. Civil with 5-7 years of experience. A mature professional with proven track record of designing HR practices & initiatives with excellent leadership skills. A post-graduation in HR preferably with engineering background and 15-20 years of relevant experience. 5. 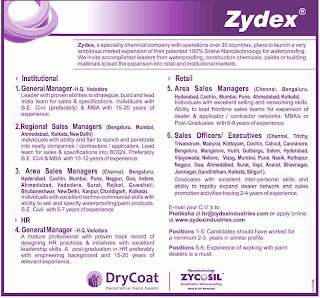 Area Sales Managers (Cnennai, Bengaium, Hyderabad,Cochin, Mumbai,Pune, Ahmedabad,Kolkata). Individuals with excellent selling and networking skills. Ability to lead frontline sales teams for expansion of dealer & applicator / contractor networks. MBA's or Post-Graduates with 6-8 years of experience. 6. Sales Officers/ Executives (Chennai, Trichy, Trivandrum, Madurai, Kottayam, Cochin, Calicut, Cannanore, Bengaluru, Mangalore, Hubli, Gulbarga, Salem, Hyderabad, Vijayawada, Nellore, Vizag, Mumbai, Pune, Nasik, Kolhapur, Nagpur, Goa, Ahmedabad, Surat, Vapi, Anand, Bhavnagar, Jamnagar, Gandhidham, Kolkata, Siliguri). Graduates with excellent inter-personal skills and ability to rapidly expand dealer network and sales promotion activities having 2-4 years of experience.